SAEM students meet magician Mike Super, America's Got Talent finalist and winner of NBC's Phenomenon. 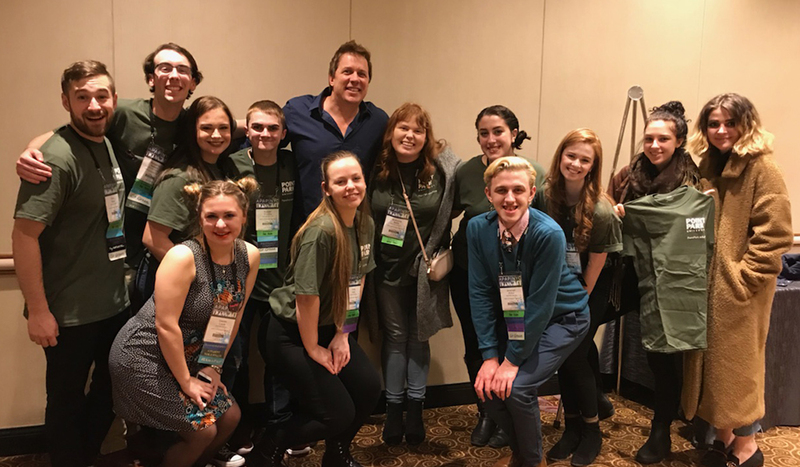 Point Park University sports, arts and entertainment management students met with more than 70 performing arts industry professionals — from booking managers, tour managers and agents to artistic directors, vice presidents and CEOs — at the 2018 Association of Performing Arts Professionals Conference in New York City. In addition to networking, the students attended a variety of professional development sessions and performance showcases featuring artists from around the world. “One of the most beneficial parts of the conference was walking around the Expo Hall and talking to companies I am interested in working for one day. Professor David Rowell was wonderful and helped us to feel comfortable talking to these influential people," said Christy Martin, a freshman. "I cannot express how grateful I am for this experience, and I am very excited to see where these new connections will lead me,” she added. Additionally, all 12 SAEM students were selected to volunteer at the APAP conference and as a result, they attended the conference at no charge and received one year of free APAP student membership. “We represented 10 percent of the volunteer work force at this conference. People at the conference began to know and recognize us. I think that a majority of the people left the conference with a Point Park business card in their possession,” said junior Emily Kelly. “The conference was an outstanding experience and opportunity for the students, and they did Point Park University and the SAEM department proud with their dedicated and enthusiastic work. I can't tell you how many people from the conference have commented to me about the students and all of their great work. We should be very proud of them and the way the represented all of us,” explained Rowell, who accompanied the students on the trip. “While volunteering, I met peers from all around the world, and learned what they do to get their foot in the performing arts business. Also, I met one of my idols in the dance world of the business, Deborah Brockus of Brockus RED in Los Angeles. With this opportunity, I was able to meet with her and establish the beginnings of a business relationship,” said junior Gabriela Prise. “The best part of APAP had to be when Professor Rowell took each of us through the Expo Hall. He got our foots in the door like no one else could with organizations we are interested in working for,” said sophomore Benjamin “Krystopher” Baklarz.